I discovered this show about two months ago and since then Iâve listened and caught up on every show and every second gate episode as well. I love it and hope it continues on forever. City Walk Florida has to happen because I need the Sector Keeper back in my life ASAP. I have been listening to Mike, Scott, and Jason since they talked about the great movie ride. And I havenât missed a Friday since then. This show is part of my weekly routine and each of the boys bring genuine humor into each episode. This podcast never deserved the 3 star rating it got and Iâm here to offset that. Loved the fake rock final four episode. Keep up the good work boys. I hope to one day survive podcast the ride! I did not know what I was getting into when I got the recommendation from a friend to listen to this podcast. I knew I was a pretty big fan of Disney attractions but I had no idea this was a level that existed. I feel much stronger in my park knowledge now. Also the Tony Baxter episode was incredible. This Pod gives me strength. My cartoon necktie would be a dark tie like the ones worn by Tin Machine. Iâm sure if the Sales boys collaborate with McGruff the Crime Dog the good boys will be the first to tell me.Also, Nick Mundy is a bad man. These guys are fun to listen too, they can get a little ridiculous sometimes but donât we all. Talk about more then just theme parks and that keeps it interesting. Like driving on Gumbo Gardens road. Nothing better! I am not alone in my nerdy fascinations of amusement parks! One of the best parts of my Friday mornings. As a theme park geek, I've searched far and wide for podcasts on that topic. The vast majority of them are dry and amount to nothing more than an information dump but this one finds a way to make a theme park podcast that is hilarious, entertaining and enlightening. Thank you guys for giving me one that doesn't feel like homework. The guys and their humor are great - this has quickly become one of my go-to podcasts. Also the subject matter is interesting - I never thought I cared about theme parks, but it turns out I really do..
My husband loves the show but already wrote a review so heâs making me write one. From all I hear from him about the show, it sounds good. He adamantly insists they do good research and always check their facts. That was something he harps on all the time and stressed that I added it to my review. Apparently, if you like theme parks and some hosts who make you feel like theyâre your friends, this is the podcast for you. Also, Iâm suppose to say that i would have a cravat for my cartoon character? Something about a Hanna Barbara episode requirement? I donât know. Subscribe and listen so my husband will leave me alone about this podcast. I survived the city walk saga. The best theme park podcast. End of story. This podcast gave me life and reinvigorated my love of fake rocks. Sector Keeper sent me cuz I'm a good boy. Couldnât love this podcast more. Good podcast but they only spend about 5 minutes per podcast on the actual topic theyâre discussing. The rest of the time theyâre rambling. Fun to listen to though. This podcast is fantastic, I love listening to every episode and just laughing along with the guys. Thank you gentleman! The Sector Keeper sent me. Took me a while to get into this, and the best parts are the episodes with the Sector Keeper.. but I got hooked enough to listen to the 19+ hours of content. President Richard Nixon pulled himself up by his bootstraps and rose to the presidency in the United States! He went to college and worked as a gas station attendant! He was never attractive or popular, but was always a diligent, smart man with incisive decision-making abilities and I will NOT stand by and have his good name be besmirched by three fake good boys!! The president is to be honored and respected! HAVE SOME DECENCY! MY CHILD LISTENED TO THIS PODCAST AND NOW HE WALKS AROUND THE HOUSE YELLING âPRESIDENT NIXON WAS BAD MAN! WHEN I GROW UP I WANT TO WORK IN THE PRIVATE SECTOR!â My wife wants a divorce! Youâve ruined my life, Podcast: The Ride. Please show President Nixon the kindness and generosity of spirit he earned during his two terms in office! Love your podcast, but for to love of all things holy leave Nixon alone! Just donât talk about him. Donât make me call the sector keeper on you. But love your In-depth explanation of all the rides/parks/food/other. This is by far one of my favorite podcast. These guys keep my laughing the entire time. The characters like Mugsy and The Sector Keeper add so much to the world building that I can only find here. Perhaps one day Mugsy and The Sector Keeper shall meet in the ultimate show down? Perhaps theyâll just do a 22 part saga on Downtown Disney. I found out about this podcast from granddaughters magazine and itâs the best. Every Friday morning the first thing I do is check my phone to see what the weekly topic is. If you enjoy theme parks give it a listen. This show is entertaining as all hell. Great mix of personalities. I donât like political talk, or humor, so I could do without the obligatory one per episode Presidential commentary, but I just roll my eyes and move on.If you want to avoid being preached at and spoken down to, skip the Bill and Ted episode. Itâs two hours of it. I really wish the boys would cut back on the politics, but this show has brought me a lot of laughs, so it still gets 5 stars from me. 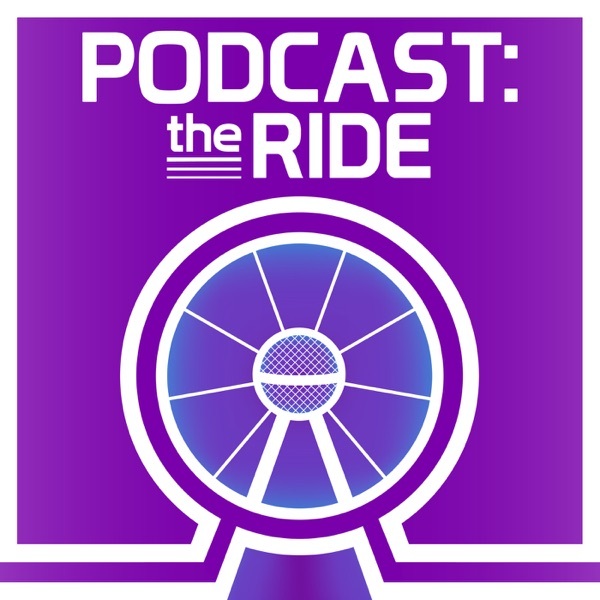 I originally listened to Podcast: The Ride on a recommendation from a theme park fan without knowing anything else about the show. It took me about 2 1/2 months of listening to realize that these guys were comedy writers, which explained why all of their childhood stories are about being mamaâs boys and social outcasts. I didnât really know what a podcast from 3 comedians would be like, but this is a lot more unintentionally funny than I expected. Itâs definitely worth your time. I love this just as it is, don't ever change. Or do change if you want to. Still perfect. Five Star is purely and only for the city walk saga.A true epic of the podcast medium.The modern day Odyssey. I am not the most knowledgeable another theme parks and never really cared about them until listening to this podcast. Now I canât get enough, even to the point of listening to 19 episodes about CityWalk. I was truly hooked when listening to the over two hour long episode about parking lots with Nick Wiger. If these men can make that interesting, then anything they discuss can be. Truly a fun and informative podcast for all fans of Disney, Universal, and theme parks. Pairs well with a nice cheese. I enjoy this podcast! I am pleasantly surprised by how much I am enjoying the CityWalk saga. Shout out to the sector keeper! I give this show 96 tomatoes. Citywalk Saga was a Masterpiece! These guys are great. I'm not too much into amusement parks, but I just love the company of the hosts and guests. This one is a must listen for me. These are good boys and they curse just the right amount. I came here for an episode with Paul Scheer and got hooked immediately. These guys (AKA The Good Boys) are very funny and have a real affection for theme parks, treats, and robots. Highly recommended. The CityWalk Saga is gold! I started listening to these boys with the CityWalk Saga episodes, and I was hooked! That whole series is pure gold (especially the episodes with the Sector Keeper).The only real negative here is that one (or more) of the hosts loudly fiddles with his mic or mic stand on EVERY EPISODE. Periodically, the boys will be digging in on a juicy riff and then obnoxious crackling and crinkling will cut through and murder my ears in my headphones. Seriously boys, please stop touching those dang mics.If you can look past a few unpleasant sound issues, there are hours upon hours of fun to be had here! Feel good and informative. Donât listen if youâre trying to avoid the temptation to spend all of your money at Disney. Even the 19 episode series on the inferior Hollywood city walk was a hoot. Hilarious, sincere, and an absolute joy to listen to. As far as Iâm concerned, Podcast: The Ride is just about the only good reason for the internet these days.